Background: Osteonecrosis of the femoral head (ONFH) is a severe bone disease that may induce bone collapse. Early-stage ONFH (ARCO I-II) commonly involves conservative treatment. 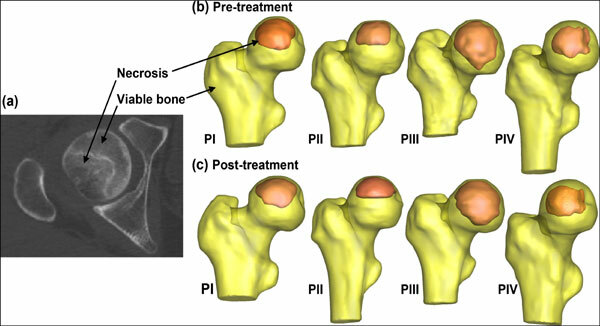 Evaluation of the treatment effects mainly relies on medical scans, which can provide morphologic information of the bone, but, there is lack of presentations of mechanical capabilities. Objective: The current study aims to propose mechanical parameters that can be used in evaluating the effectiveness of medical treatment on ONFH. Methods: Patient-specific models were established based on medical scans and anisotropic elastic properties of the bone are assigned based spatial-variant HU value. Finite element analysis was conducted in each model and the mechanical behavior of femur was compared between pre- and post-medical treatment. Results: Positive morphologic effects were found on all the studied patients after medical treatment; the necrosis-to-femoral head volume ratio was reduced. However, the stress distribution presents difference among cases. The stress index, defined as the ratio between the equivalent stress and compressive strength, is proposed and used to assess mechanical capability of the bone, the smaller value of which indicates better strength of the bone. In cases with necrosis at the superior region, the stress index reduces; while in the case with anteromedial-located necrosis, the stress index increases, indicating lesseffective treatment results and consistent to follow-up examinations. Conclusion: This study implicates that to evaluate the effectiveness of the medical treatment, morphologic change should be considered but mechanical capability of the bone, which is related to the size, elasticity and position of the necrosis, play a more important role. Osteonecrosis of femoral head, proximal femur, necrosis, finite element analysis, volume ratio, stress index.